Classic smog results from large amounts of coal burning in an area and is caused by a mixture of smoke and sulfur dioxide. 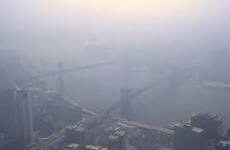 Smog is a problem in a number of cities and continues to harm human health. It can inflame breathing passages, decreasing the lungs' working capacity, and causing shortness of breath, pain when inhaling deeply, wheezing, and coughing.